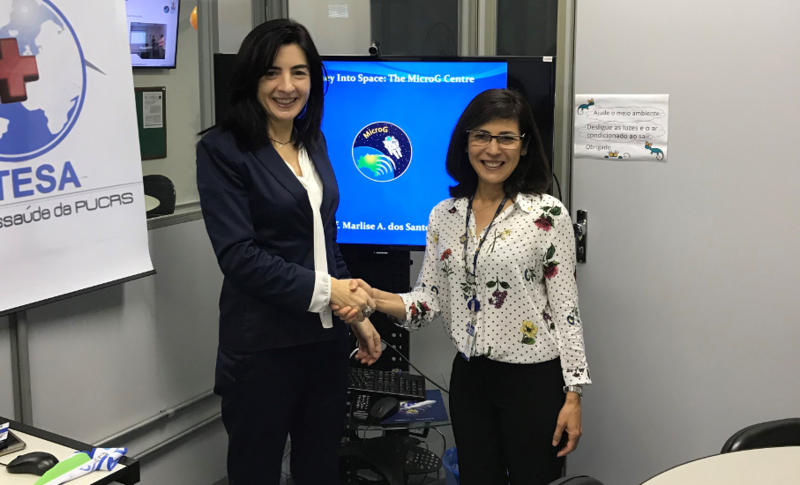 PUCRS’ Microgravity Center (MicroG) welcomed the member of the Agricultural Committee in the European Parliament, Giulia Moi, PhD. She was invited by MicroG researchers to check out the simulated hypergravity project used for growing plants. “I acquired a lot of knowledge of the hypergravity system and its application in innovative technologies. I hope that this kind of working model can be exported even to other countries such as Italy and open the way for productive collaborations between the EU and Brazil”, states Giulia. The European agricultural asset is still facing controversial issues related to the use of pesticides. According to Giulia, the development of new technologies could be helpful to ban the use of chemical substances in European agriculture. During the meeting, Giulia and the MicroG team shared their views and opinions on the Brazilian and the European university systems. They discussed funding possibilities and the programs of the European Union to help the development of scientific research, among other topics. “At the moment there is no official partnership between the Brazilian project and the European institutions but I wish that this visit could be a first step to open a dialogue and to build a productive collaboration on different levels”, says Giulia.